This past Saturday, Martha and I each made a cloth flower wreath, like the one Mandi had on her front door at my baby shower, using this flower tutorial. It's been so enjoyable to see it when coming in the door everyday this week! These really are so easy, just like Mandi told us they were, but I thought I'd share some little nuances that we discovered. We cut our strips of scrap fabric about 1.5" wide and the length of a yardstick (36" obvi) and ironed them flat. We did her step of hemming one end for the first few, but I don't really see the benefit/point of it...you can just hide the end where you start your stitches at the bottom of the flower. and then iron it flat. 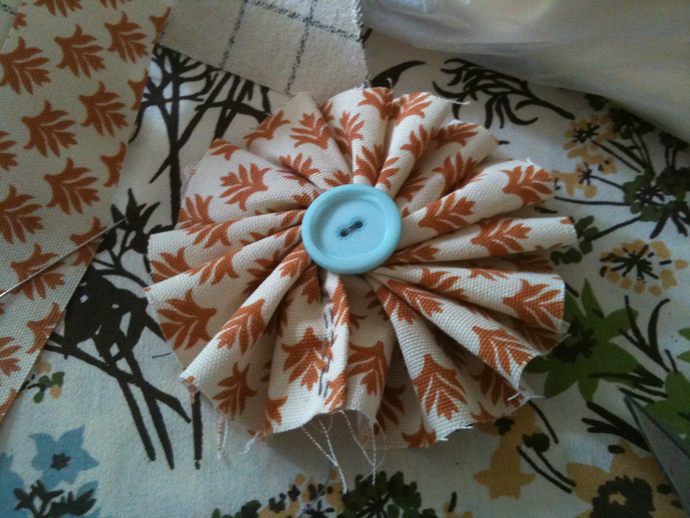 We sewed the buttons on a few of these with loose stitches from underneath the center of the flower...but most of them we hot-glued on. We used half the little piece of cardboard that the buttons came on as the backer. 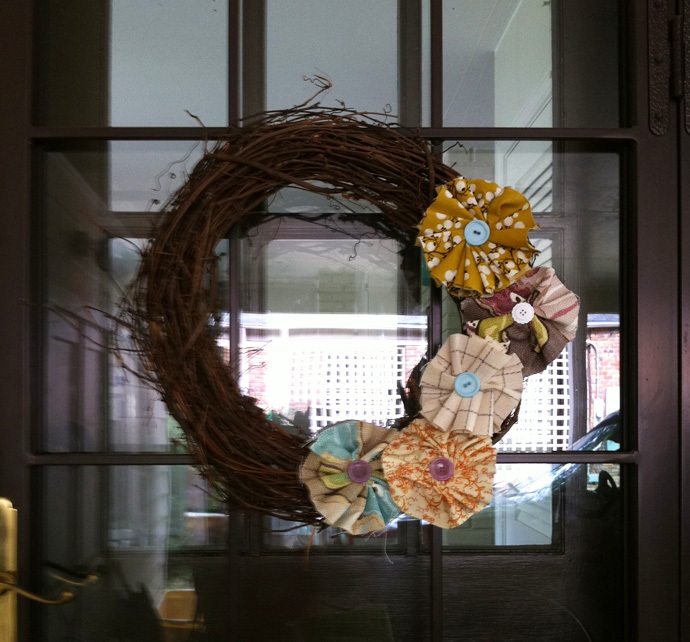 This gave us something more secure when gluing/attaching the flower to the actual wreath. woo hoo! Thanks, Mandi, for spying this one! Super cute. I love how easy the flowers are. Just found your blog when I did a search for flower wreath. how did you get the flowers to fold like a fan? first time to do anything like this. I hope you see this post asap. I ironed down the pleats once we sewed those loose stitches. ok, i should have asked this last night.... how do you do loose sitches? what setting do you put it on. Thanks so much for being quick to answer. I'm have a shower here at my house on Saturday! 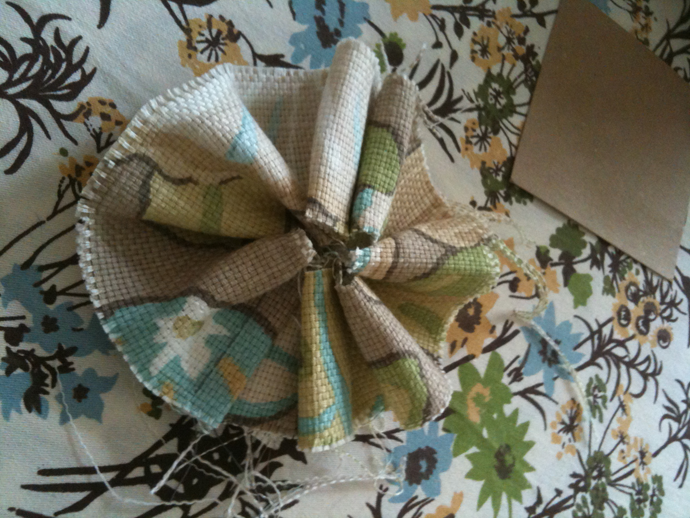 Use needle and thread instead of machine! Our stitches were at least 1.5" wide. ohhhh ok.... thanks so much.....!! !